All summer camp classes are full. Thank you for your interest and we hope to see you next year! The AMC Museum’s educational summer camp is for children interested in aeronautics and the U.S. Air Force. They will learn the history and science of flight, learn to fly in a simulator, and pre-flight an actual aircraft. They’ll also see what it’s like in a working air traffic control tower on base, get a weather briefing, talk to a pilot and loadmaster, and go on a digital scavenger hunt! 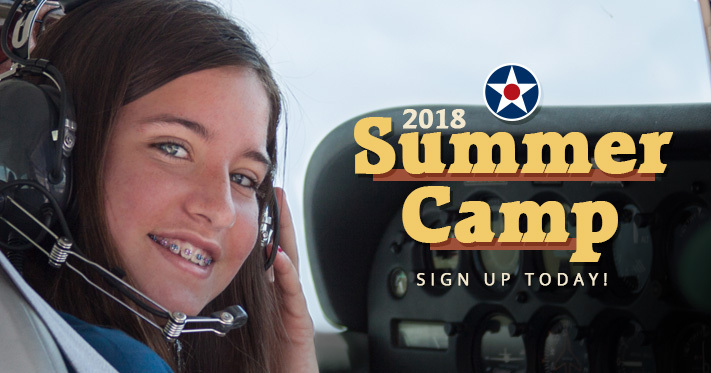 A unique feature of this summer camp is the option of a flight in a Dover AFB aero club plane around the base flight pattern for only $25. Half-day classes are from 8:30 to 11:30 a.m. for ages 9 to 11 and 12:30 to 3:30 p.m. for ages 12 to 15. Dover AFB Aero Club flights will be on Thursdays, weather permitting. Flights will take place on Fridays if necessary due to bad weather. Cost is $100 for a week of half-day classes and $25 for the optional flight. Enrollment is on a first-come, first-serve basis. Classes will be cancelled if a minimum number of students have not registered. A full refund will be given if class is cancelled and the student cannot attend another. A refund will be given if flights must be cancelled for weather or other events beyond the AMC Museum’s control. If you must cancel we must receive 72 hours notice for a refund.